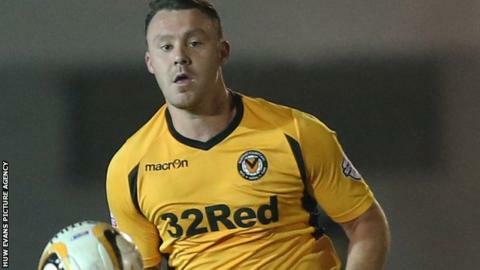 Wales defender Darcy Blake says he will consider his Newport County future over the next few weeks. Blake was released by Premier League Crystal Palace in January and signed for the Rodney Parade club for the rest of the 2013-14 season. "I have spoken to the manager [Justin Edinburgh] and the coaching staff and I'm happy and I'm happy playing," said the former Cardiff City player. "I'll have to sit down with my agent, take a little break and then decide." Since moving to Newport Blake has made seven league appearances. Manager Justin Edinburgh hopes to keep 14-cap Blake and believes it would be a coup for the League Two club to retain him. "We are speaking with Darcy's representatives [and I] sit down with the board tomorrow, which I'm sure will finalise what next season's budget will be," said Edinburgh. "We are hopeful of Darcy, among other players already here, that they will sign for the next season. "If we can keep Darcy here for next season I think would be a fantastic achievement." Former Cardiff City player Blake says he feels settled at Newport. "I came here to play games and I've played a few games now," he said. "That's no different to next season. I want to have a full season under my belt. If it's here, it's here and I'm happy to play. "[The manager] is happy with me and he'd like me to sign and keep doing what I'm doing. "If other clubs come in for me he understands. We'll see." Blake last played for Wales in a World Cup qualifier in Croatia and before joining Newport had not played a competitive game for 15 months since Palace's 2-2 draw at Blackpool in December 2012. New Tredegar-born Blake came through the youth ranks at Cardiff, making 115 senior appearances for the Bluebirds before joining Crystal Palace in August 2012.